There comes a time in every blogger's life when she does the unexpected. That day is today for me. I posted an outfit on a Monday! I mean, things are getting crazy. I figured I owed the blogosphere a post today since last week was... busy (that's an understatement, my friends). So, you get an outfit. I usually keep my outfit posts to once a week because well, I don't really consider myself a style blogger. I mean, anyone can be a style blogger - I get that I don't have to wear 3.1 Phillip Lim for that. But I'm just not that into fashion. I'm really not. I also don't own a ton of clothes, so there is a limit to my remixing. I will say that I dress much better due to blogging - it keeps me on my toes (no more pretending that nightgown is a tunic and then trying to wear it to work). You are so sweet! I love how your smile is just radiating darlingness:) Love the outfit- perfectly cute! Looking cute! Love your pattern mixing. Hope you had a great weekend! 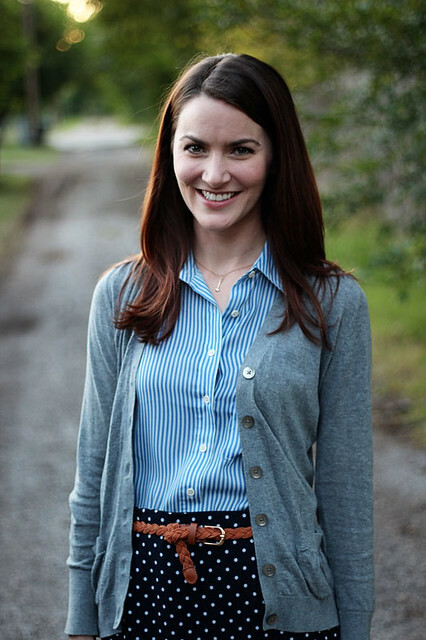 I love the cardigan with the blue! Haha love it! Love the stripes and polka dots - I've got to get better at this 'mixing patterns' thing! In love with your outfit! You have such style! love how cute and simple this is! wooaah picking up your game! haha and i think this outfit is adorable (and id never guess you didn't have a lot of clothes!). I really like the mix of polka dots and stripes- it's so subtly but still eye catching. I know, thank heaven's for style blogging right? It totally helps me get dressed some days! I LOVE this look on you. Its so on trend for someone who claims not to be stylish. Silly girl! You look fantastic! Oh....and I am a style blogger who doesn't do outfit posts...a bit camera shy I am....and a budget babe. Lol! Style pretty doll! I feel the exact same way! I'm really not that into fashion or trends, but I do enjoy buying and wearing clothes, and blogging helps motivate me to not wear the same thing every day! Love this outfit! 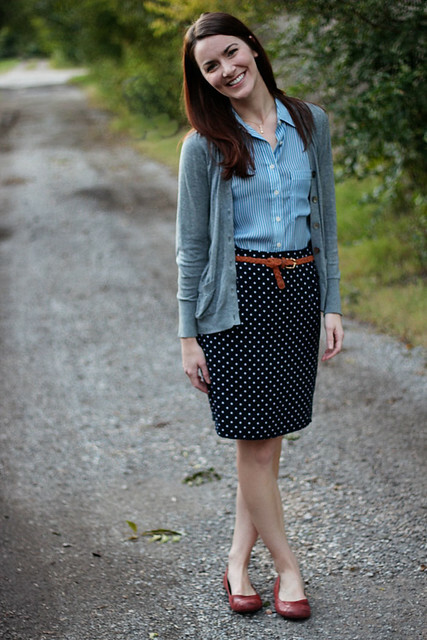 Perfect pattern mixing and that cardigan looks so comfy and cute! This outfit is so cute! 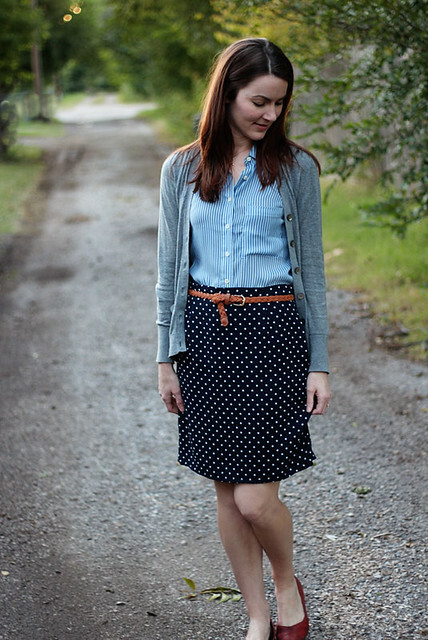 I love the belt/skirt/shoes combo in particular!